With his first North American tour in more than a decade set to kick off next week, legendary guitarist MARTY FRIEDMAN has unveiled "Jasmine Cyanide," a track recorded during the sessions for his latest album "Inferno." The song -- which features vocals by Canadian rocker Danko Jones and TesseracT's Daniel Tompkins, as well as guitar work by Keshav Dhar (Skyharbor) and drums by Anup Sastry (Jeff Loomis, Intervals) -- is one of two bonus tracks that appear on the new deluxe edition of "Inferno," which will be released across digital platforms this Friday. Listen to it now below. 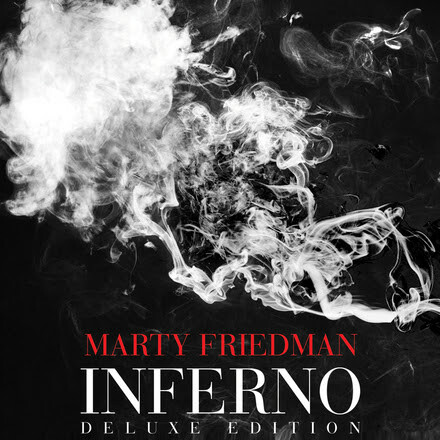 FRIEDMAN -- who recently guested on will perform live in the U.S. for the first time in a dozen years next week, when he kicks off the "Inferno" North American tour in his hometown of Baltimore. The headlining run, which features support from Los Angeles-based heavy metal outfit Exmortus, concludes on the West Coast on Oct. 3. General admission and VIP Tickets (which include a meet & greet) are available now; checkwww.martyfriedman.com or the poster below for further details. FRIEDMAN will also appear on the inaugural 2016 Axes & Anchors Cruise (Zakk Wylde, Yngwie Malmsteen, Michael Schenker), where he will perform two sets and host a guitar clinic. Reservations can be made now at www.axesandanchors.com (use the code MARTY16 when booking to save $100).